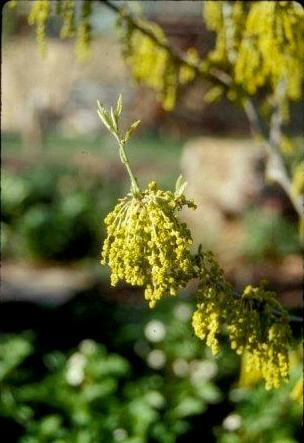 as a multi-stemmed, suckering, large shrub or small tree, 6 - 16 feet in height. It is native in the eastern U.S. as far west as southeastern Minnesota, eastern Nebraska and Texas. Prairie Pioneer™ a seedling selection grown from seed collected from a native stand in southeast Nebraska by Greg Morgenson, manager of Lincoln-Oakes Nurseries, Bismarck, ND. This novel, small-statured, tree-like cultivar is collaboratively released by NDSU and may reach 24-28 feet in height at maturity. It has withstood -35 to -40°F several times in Bismarck, ND, and therefore is hardy in zone 4, and potentially zone 3b as well. Prairie Pioneer™ selected for its dark green, very lustrous foliage and upright growth habit easily trained to a single stem. The leaves vary from 2 - 4 ½ inches long, ovate-oblong to obovate, acute tipped and wedge-shaped at base, with 4 - 6 shallow undulate to dentate teeth on each side. The lustrous foliage is somewhat reminiscent of the leaf quality on broadleaf evergreen holly species. The underside of the leaves is finely tomentose and lighter colored. 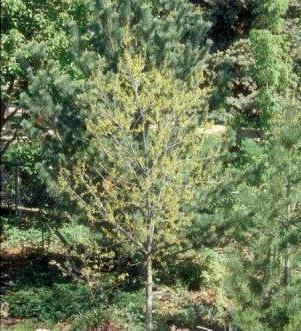 In spring, trees are covered with yellow male catkins before leaves emerge, and sessile acorns are produced if a suitable white oak member species is in the area for pollination. Fall color is typically yellow to tannish-brown. Propagation is by side grafting on containerized seedlings of chinkapin oak (Q. muehlenbergii), swamp white oak (Q. bicolor) or preferably, bur oak, if proven to be compatible. Prairie Pioneer™ merits attention as a dense, quality-foliaged small tree for residential landscapes and various sites where large trees are unsuitable.